We love this recipe from Ana Maria at www.detoxdiy.com. Hope you love it, too! 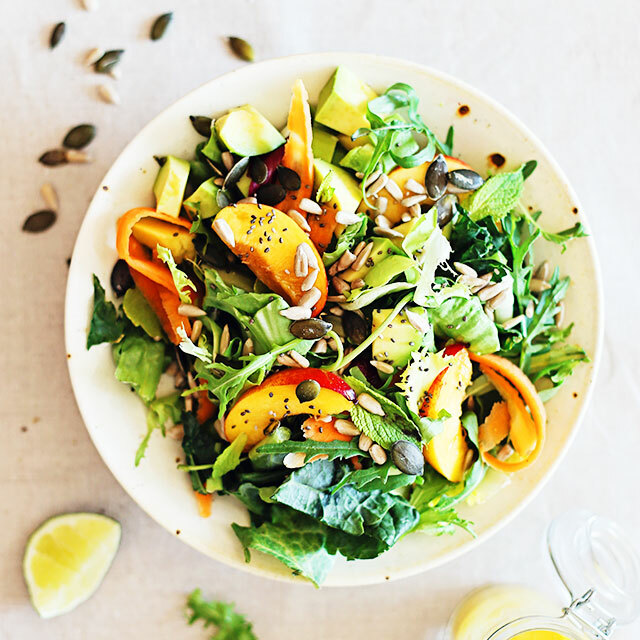 Enjoy my glowing skin detox salad for an all-natural way to beautify the skin by giving it the nutrients it needs to look its best. It’s a delicious way to get compliments on just how great your skin looks I love summer, but it’s also the season when my skin is challenged the most. While I try to always wear a high SPF cream, I’m also looking for natural alternatives to protect my skin from the inside out. Our skin regenerates every 30 days, older cells are constantly being replaced by younger ones and need essential nutrients to support their rapid growth. While all fresh foods are loaded with vitamins and minerals and make a great choice, some of them will deeply nurture the skin, giving a healthy boost and simply make your skin glow. Be sure to get your antioxidants each day. Making your plate colorful doesn’t just make it look pretty, – each color is a signal of a high antioxidant content. This will protect your skin from free radical damage. Yellow and orange fresh fruits and vegetables (papaya, mango, pineapple, apricots, peaches, carrots) contain large amounts of beta-Carotene, a well known skin protective antioxidant. Kiwifruits and most of the berries are loaded with Vitamin C which gives your skin a healthy glow and helps blemishes heal properly. The queen of greens, kale, contains both beta-Carotene and Vitamin C, along with other nourishing phytonutrients, making it a fantastic food to add to your daily diet for natural detoxification and impeccable skin. Selenium is not only an essential detox ingredient, but also a powerful antioxidant, working along with vitamins C and E to support healthy skin, protecting it from sun damage, age spots, and cancer. Nuts and seeds are the best source of selenium, especially Brazil nuts and chia seeds. Vitamin E is a fat soluble vitamin that plays a major role in skin protection because it penetrates into the membranes of the skin cells and protect them against the effects of lipid peroxidation which results in cell damage. It also slows down melanin production, reducing the appearance of age spots. Sunflower oil, hazelnuts, and avocado are excellent sources of vitamin E.
Omega-6 and Omega-3 are the single fats our bodies can’t produce, so we must provide it from foods in our diet. Leafy vegetables like spinach, kale, or parsley, flax and hemp seeds, and avocado are the best clean sources of essential fatty acids. In a large bowl add all the salad ingredients and toss to combine. Add the dressing ingredients into a blender and process to obtain a creamy sauce. Pour it over the salad, mix to combine and serve.